Another 14 levels are in the books for The Star Sydney World Series of Poker International Circuit $2,200 Main Event as Day 1B played out on Saturday, December 8th. The second of four starting flights drew out a total of 225 entries. Combined with the 170 from day one that makes 395 entries so far. Only 42 survived on Day 1B so, in total, 73 survivors have advanced to Day 2 so far. 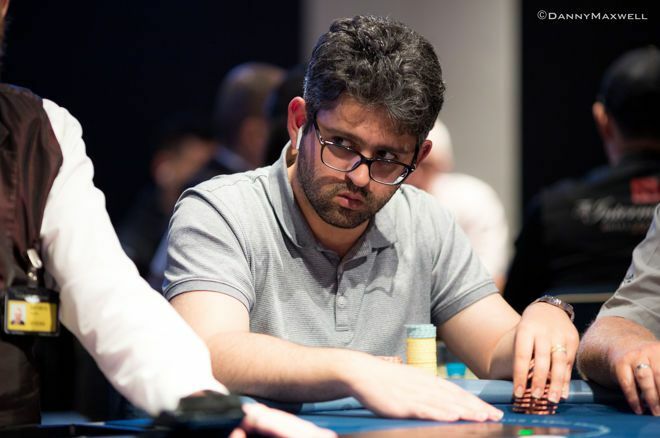 Bagging the biggest stack after the second flight of play was Ali Aflatounian (lead photo). Aflatounian picked up a big stack in the middle of the day after flopping a set against an opponent and getting paid on multiple streets. But the majority of Aflatounian's chips came from a huge hero call her made against an opponent. Aflatounian held ace-jack on a wet board of and his opponent moved all in. Aflatounian thought it over and called only to have his opponent reveal jack-high, shocking the table. With that, he took the lead in the chip counts and holds the biggest overall stack after two days of play with 430,500. Michael King also bagged one of the largest stacks of the day, finishing with 400,000. King stayed relatively unoticed for most of the day, but in the final level of play, King stacked an opponent holding top two pair. King shoved all in on the river, and his opponent tanked for quite some time before calling. Players speculated the King's opponent was holding a worse two pair, but King wasn't sold on it, saying that he thought his opponent made a hero call against him. That pot pushed him over 300,000 chips though, and he would hold onto that big stack as the day came to a close. Among other who made it through on Day 1B were the likes of Joel Dodds (290,000), Haoran Zhang (149,500), Michel Bouskila (197,000), George Mitri (128,500), Henry Tran (212,000), Andrew Scarf (196,000), Andy Lee (172,500), Rob Damelian (298,500), Tatjana Zizic (159,500) and Steve Pappas (172,500). Some who didn't far as well though were Andrew Hinrichsen, Gary Benson, Stevan Chew, Sean Dunwoodie, Najeem Ajez, Billy Argyros, Brett Trevillian, Federico Butteroni, Sam Khoueis, Errolyn Strang andJan Suchanek to name a few. Suchanek had a roller coaster of a day, getting involved in big pots from the start, but in the end, he was caught bluffing by Andy Lee. Lee made a hero call on an ace-high board holding pocket queens, and Suchanek just held an open-ended straight draw. He bricked out on the river, so Lee took down the big pot to send Suchanek home early. The Main Event will be taking a break for a few days while several other events will kick off in the next few days. The next coverage of the Main Event will begin on Thursday, December 13 with Day 1C starting at 12:30 p.m. But don't tune out yet. PokerNews will be covering several of the other side events at this stop including the $1,320 Six Max event which begins on Sunday, December 9th at 12:30 p.m. so make sure to tune back in. Check out al the WSOP International Circuit The Star Sydney live updates.